Posted by DustinRJay in Calgary real estate, residential construction. Residential units under construction in Calgary is at unprecedented levels, easily surpassing the residential construction rate during the early 1980’s boom. There are record levels of inventory in the resale market with over 13,000 units for sale in the Calgary and surrounding area. This is coupled with yet another 14,000 units under construction and due to come on the market shortly. This should be very worrying for developers. Total residential units under construction would likely need to correct by more than 30% or to roughly pre-2006 construction levels to stabilize the supply/demand balance. If inventory continues to build and starts do not drop off than the correction will become more severe. In general: as housing starts increase, house prices go up. As housing starts decrease, house prices go down. This graph shows a recent American example. The fact that housing construction has increased relative to population growth is an indicator of a developing supply glut. Residential construction should have a trendline roughly parallel to population growth. Alberta has one of the highest costs of living and some of the poorest housing affordability in the country so it is unclear how population growth can continue at recent high growth rates. Recent Statistics Canada information has shown Alberta as having negative interprovincial migration. Housing production rates are firmly coupled to house prices. The number of residential units under construction has tripled since 2000. There is a better correlation between house prices and units under construction than population growth and units under construction. High carrying costs caused by a combination of high prices and higher interest rates was the primary cause of the 1980’s real estate crash. It resulted in a foreclosure boom and housing construction levels were decimated in only 2 years. Like we would see anything remotely similar in aptitude from the shills and ramens. This was totally new information to me after I put the graph together that 1980’s construction levels were as high as they were. 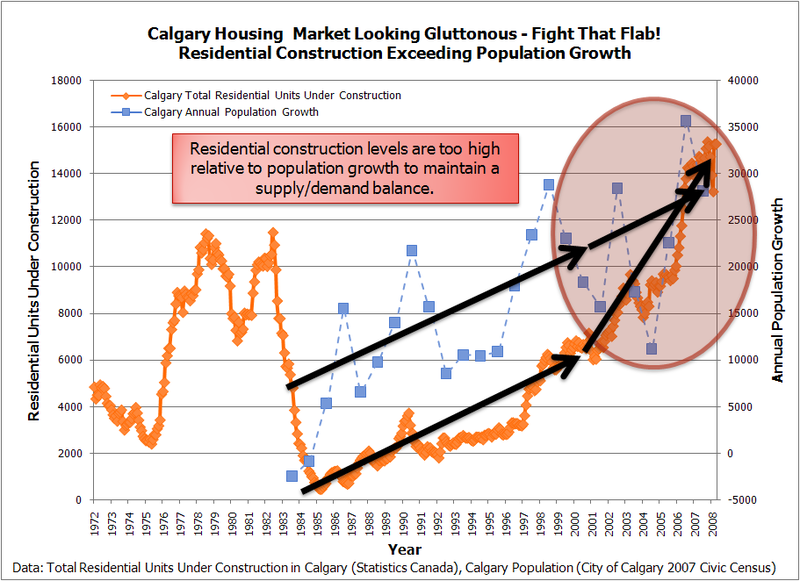 The 1980’s Calgary boom and bust appears to have created a housing depression in it’s wake that lasted a decade. The low oil prices of the 1990’s probably kept the industry from performing at par as well. I am estimating that the under construction range should be closer to the 8,000 – 10,000 to be balanced. However, I could see construction levels falling below that range if economic conditions were to deteriorate. I am curious, what would your estimate be for a balanced amount of supply for Calgary? This is great information – good post. What is the difference between the 14,000 units mentioned above and the 30,000 units mentioned on Bob Truman’s blog? Are you looking at a longer time-frame with the 30,000 units? My bad, should have been 14,000 instead of 30,000 assuming all units currently under construction are finished within a year. Is there any way you could super-impose average yearly price on top of this graph?? I think that would show a further important layer of market (re)action? So … from the second point from top, are there going to be a total of 27,000 units on hand shortly? Am I reading this correctly? How many months supply will there be? Claeren: Hi. I’m putting together another blog post regarding house prices and construction rates and hope to have that up shortly. Darrell: Units under construction should be read from the left axis. So, there are roughly 14,000 units under construction in Calgary.